In a previous post, we met Beth and Andy, two fictitious (but reality-based) designers who take very different approaches to their target market definition. Andy’s approach is “I can do it all, and all sales are good sales.” Beth is more deliberate and precise. By defining her ideal client and project, she also defines the kind of business she doesn’t want. Hers is a much more effective approach, particularly for challenger brands. This is bedrock. 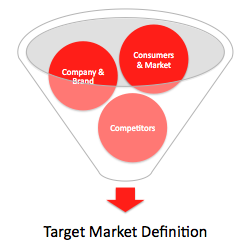 Your target market definition is at the core of your brand strategy. It’s not something to select impulsively. Make it a priority and give it the attention it deserves. Get narrow. If you are competitively disadvantaged in resources or market share, here’s your mantra: “Get narrow.” It’s better to focus on a precise target than to spread your limited resources thinly across multiple targets. Choosing a narrow target doesn’t preclude you from doing business with others, but it absolutely helps you to attract the business you want most. And in delighting the few, you’re likely to attract the many. and sufficient resources to reach and serve. Current Consumers: Who are they? Why do they buy? Who are your best and most loyal consumers, and what are their common characteristics? Usage: How is your product or service used? How does it fit into the lives of your consumers? Segmentation: How can the market be segmented? (Remember, there’s more than one way to segment – geographic, demographic, behavioral, psychographic, etc.) What are the characteristics, sizes, growth rates and margins of these segments? Needs: What are the needs of specific consumers – both spoken and unspoken? Strengths: At what does your brand or company excel? Consider the entire value chain, not just end users. Passions: Does your firm have a burning desire to serve certain consumers, to solve certain problems, or to somehow make the world a better place? Benefits: What are the features of your offering? Convert these to specific benefits, and identify which consumers would most desire those benefits. Business Strategy: Does your firm have a vision, core strategy or operational strengths that will influence target selection? Resources: What resources and investments are available to you as you go to market? Experience: Does your prior market experience lead you toward certain targets or away from others? Degree of Competitive Rivalry: There’s just one here, but it’s a biggie. Analyze whom your competitors are targeting. (You may have to rely on inference, but sometimes they’ll come right out and tell you in their PR.) If they can out-market you – either through spending or smarts – it’s usually best not to go after their target. However, just because they target someone doesn’t mean you can’t, especially if you have a true right to win. There’s a lot to know, and getting the answers will require an investment of time and/or money. If you’re struggling to get started, begin with “best current thinking” – those things you already know or firmly believe. Then identify your knowledge gaps, and pursue those questions that will deliver the greatest return. One clear favorite emerges. Sometimes the stars align and the data points to one clear target market definition. (This happens more often than you might think.) Waste no time – immediately focus your resources on reaching and serving this target. No possibilities emerge. If you can’t identify a target with which you truly believe you can win, then you have a core strategy problem. You need to improve your offering or exit the business, because you can’t win as is. A few viable possibilities emerge. This is the most likely scenario. Unfortunately, it’s also highly situational, and thus difficult to fully address here. But in general, you should favor targets in which both affinity and right to win are present, and market potential is sufficient to justify investments. Demographics – Age, gender, income, geography, etc. Your target market definition then forms a critical piece of your full positioning statement. Once you’ve selected a target market, your work is just beginning. The more you learn about your target, the sharper your marketing will become. As you reach an advanced level of intimacy, your consumer intelligence can become a source of competitive advantage. Deeper insights may drive, for example, product innovations or communications platforms. Information is everywhere, so grab everything you can. When I positioned Airheads candy in the early ‘90s, I read books on child psychology and did a lot of in-store observation at convenience stores near schools. Both were very valuable, and both were free. And there you have it. Creating a target market definition can be challenging (though often fascinating). But doing so, thoroughly and deliberately, will provide a critical competitive edge. And without a clear target market definition, the rest of your marketing plan is mostly fluff.